Traditionally, curly dock roots were used as a remedy for internal parasites and skin conditions, and new research points to even wider use. Hailing from Europe and widely distributed around the world, curly dock - also known as yellow dock - is now considered as an aggressive weed; however, it has a long history of medicinal applications that are still valued by herbalists. The medicinal properties of curly dock lies in its roots, and has made it a valued herb for treating various ailments. Relieving constipation. The laxative properties of curley dock stimulate intestinal transit and facilitate bowel movements. Reducing inflammation. Curley dock has compounds that are able to reduce swelling and pain, as well as soothing skin ailments, such as nettle stings, eczema, and boils. Traditionally, curly dock roots were used as a remedy against intestinal parasites, and various parts of the plant were also prescribed to treat rheumatism, jaundice, and scurvy. Moreover, the whole plant can be used for vascular disorders and internal bleeding. This nutritious herb is rich in flavonoids, iron, and vitamins A and C.
The main compounds behind curly dock's health benefits are anthraquinones and flavonoids. Curly dock's anthraquinones stimulate the areas in the brain that are responsible for regulating peristalsis - the movement of the intestines - giving the herb a laxative action, which makes it beneficial for relieving constipation. Curly dock has twice as much myricetin as broad beans or onions, six times that of red wine, and about eighteen times that of black tea. On the other hand, the flavonoids contained in curly dock possess a strong antioxidant ability, which helps protect cells from free radicals, thus preventing age-related diseases and relieving inflammation. The leaves of curley dock are rich in quercetin and myricetin, both powerful flavonoids with antioxidant, anti-inflammatory properties. While quercetin also offer antihistaminic properties, myricetin, which is particularly abundant in curley dock, exhibit hypoglycemic and antiviral effects. Curly dock seeds have 20, 000 units of vitamin A per ½ cup. Senna and tamarind also possess laxative properties, whereas aloe and nettle can be used as alternative sources for anti-inflammatory benefits as well. The anthraquinones in curly dock can cause dependency, so the use of the herb as a laxative should be temporary and not a long-term solution for constipation. Additionally, the leaves of curly dock contain soluble oxalates that can be toxic if consumed in large amounts or if not cooked properly. Curly dock is classified as a noxious weed because it can be toxic in high doses due to its oxalic acid content. Curly dock is primarily used for its extensive medicinal purposes; however, it is sometimes consumed for culinary purposes. In medicinal preparations, curly dock is typically taken in combination with other herbs, like dandelion root or burdock root. Cooked. Curly dock leaves are rich in vitamins C and A, and offer a bitter, lemony taste. The leaves can be eaten as a side or added to soups. Infusion. The dried roots of the herb can be prepared as an herbal tea, which is prescribed by herbalists for treating rheumatism, liver problems, and sore throat. Decoction. When applied topically, a decoction of the roots can help relieve skin sores. Powder. The curly dock root can be ground into a gluten-free flour as well. During early spring and summer, young curly dock leaves are edible as cooked greens in limited quantities. Syrup. A decoction of the herb can be boiled with honey or cane sugar until it takes a thick consistency. This remedy can be taken for the relief of constipation. Tincture. This remedy is made by macerating the crushed parts of curly dock with vodka or a neutral alcohol. It needs to be diluted in water before being consumed in order to treat jaundice and scurvy. Ointment. This oily preparation can be applied topically for treating rheumatism. Capsules. The dried and ground roots of curly dock can be inserted into gelatin capsules to be taken orally in medicinal doses, avoiding the particular taste of the herb, for treating constipation. Curly dock plants are ubiquitous in the wild and it is quite easy to come across them in fields, gardens, and roadsides. The dried roots are available year round in most herbal shops and specialty grocery stores. Simply processed syrups and tincture, as well as curly dock supplements can be found in specialized health stores and online retailers. They should not be taken for long period of time because the body can grow dependent on them for bowel movements, and the herb may increase the risk of kidney stones. Curly dock is considered an aggressive weed, and is now one of the most widely distributed plants in North America, as well as globally. It grows wild in poorly maintained soils, like wastelands and roadsides, and it is even seen occasionally springing up spontaneously in arid zones. However, curly dock can also be cultivated in a back yard or home garden, in order to take advantage of its medicinal benefits. Curly dock grows best in cool, wet climates, and prefers deep, moist clay soil. It can propagate in full sun or semi-shade, and it usually grows directly from seed. A curly dock plant produces around 40,000 seeds per year, and they can lay dormant for up to 50 years. Seeds are usually sown 1/4 inch (0.6 cm) deep, with as little as 8 inches (20 cm) of distance between each plant. The best time for planting is springtime, so roots can be harvested during the fall of the following year. Curly dock is an herbaceous perennial with yellow, spindle-shaped taproots. It has a slender, erect stem that grows to about 3 feet (90 cm) in height. Curly dock is characterized by its distinctive pointed green leaves with curled edges; pale green, drooping flowers; and reddish-brown winged fruit. 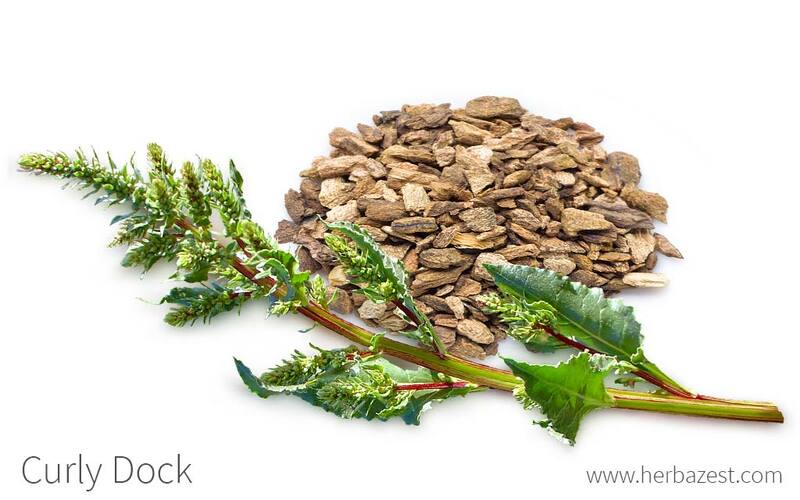 Curly dock (Rumex crispus) is a member of the diverse Polygonaceae family, which encompasses 1,200 species, including trees, shrubs, vines, and herbs, such as buckwheat (Fagopyrum esculentum) and rhubarb (Rheum rhabarbarum). Since curly dock grows in the wild and is not commonly cultivated, no varieties have been identified nor cultivars developed. The plant is sometimes confused with another member of its genus, broadleaf dock (Rumex obtusifolia), which has wide leaves and is less widely distributed globally and in the U.S. than curled dock. Curly dock is a native of Europe, but today it occurs worldwide: above the Arctic Circle and on all continents. The herb has a long history of medicinal applications. Native Americans reportedly used the seeds in flour and meal; they cooked a mush from the seeds, but only in times of need. The dried fruit stalks have been used in flower arrangements and holiday wreaths. Curly dock was first described by the Swedish botanist and explorer Peter Kalm in 1749 and Linnaeus gave it its scientific name few years later. Rumex is the Latin word for docks, and "dock" itself derives from the Old English docce, which may be translated as "a dark colored plant." On the other hand, the name of curley dock's genus, crispus, is the Latin word for "curled, curved, or wavy." Curly dock is technically considered a weed in over 40 countries, so there is no substantial information about its economic value. However, the plant is valued by herbalists, who use its roots and leaves in supplements and various medicinal preparations.